Uganda Railways Corporation, the company which operated rail transport in the country until the government passed its operations to a concessionaire in 2006 is set to return in September. And if there is one person who is super excited about the move, it has to be Kassim Omar, the chairperson of Uganda Clearing Industry and Forwarding Association (UCIFA), an umbrella body of indigenous clearing and forwarding firms in Uganda. He told The Independent that he cannot wait for the return of the UR-double black letters on a yellow background in a red border; the company ligature in Uganda's national colours. "I am very happy that Kenya-Uganda Railway is returning to the Ugandan government because that is what we have been advocating for. "In any case, there was no need for the government to sign that concession because all that was needed at that time was to find a way to strengthen Uganda Railway Corporation than trying to look for concessions... RVR was a total failure," he added. Omar says RVR was carrying only 5% of the freight volumes from the port of Mombasa, leaving the bulk of cargo to be transported by road in spite of the fact road transport costs 15% more of the total freight costs. 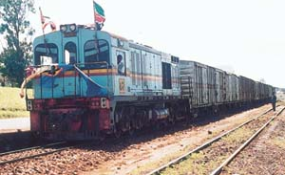 Uganda Railways operations were contracted to Rift Valley Railways (RVR) in November 2006 in a 25-year concession. Under the deal, RVR was to run the 2,352km Uganda-Kenya railway for freight business, and a five-year contract for the passenger unit. But it now appears RVR just lost its concession over the century old metre-gauge railway. Kenya already terminated its contract with RVR on July 31 and Uganda plans to do the same by Sep. 04. Charles Kateeba, the managing director of the Uganda Railways Corporation confirmed the development to The Independent in an interview. "After terminating the contract, Kenya and Uganda through their agencies Kenya Railways and Uganda Railways Corporation, respectively, will run the show," Kateeba said, "we are going back to the old arrangements." He said a 3-month notice of intent to terminate the contract was issued to RVR in June and added that the two governments are currently preparing for the rail take-over next month subject to RVR not running to the courts to block the move. RVR has for some time been cash-strapped and unable to meet the costs of its operations and obligations of the concession. Not that it came as a surprise to the many voices that opposed the concession in 2006 and have watched it tumble from one crisis to another. Under the concession, RVR was to pay $3million and $2million to the Kenyan and Ugandan governments respectively as well as concession fees equivalent to 11.1% of its gross revenues per year in each country. It was also supposed to pay US$1million per year to Kenya for passenger operations. Other conditions included continued investment in the railway network and increase the freight volumes. But while RVR was able to meet the initial payments and invest substantial amount of money into the rail network through revenue generated and loans, it failed to meet other requirements including paying concession fees and increase in freight volumes. Kenya demands Kshs600 million from RVR at the time of terminating the contract. The money Uganda demands from RVR is a tightly guarded secret. But more than 400 RVR Uganda workers downed their tools on August 03, citing non-payment of June and July salaries. This new development comes barely a year since Qalaa Holdings, which owns 80% of RVR, started holding discussions with potential investors including America's Emerging Capital Partners (ECP) to sale its stake in RVR. But it has been unable to get the buyer, with the ECP terminating all the negotiations after RVR's top lender, World Bank, imposed sanctions on the company, accusing its managers of conspiracy to defraud lenders and the Kenya Revenue Authority (KRA) millions of shillings, and leaving the company in a worse financial position. This was prompted by a $22 million loan that the International Finance Corporation (IFC) - the World Bank Group's private sector arm - extended to RVR in support of the company's planned purchase of 20 locomotives for its flagging operations in 2014 and 2015. The audit found that RVR executives bribed public officials, manipulated accounts and created convoluted ownership and operational structures with the aim of defrauding lenders, including IFC. The act, according to the Bank, were meant to conceal the company's true financial position, which had deteriorated because of its inability to generate cash even as its liabilities mounted. For instance, the bank's assessment found that the individuals inflated the cost of the locomotives, bribed KRA officials to avoid paying Kshs377.4 million in Value Added Tax on the engines and misled IFC on the true status of RVR's operations. It also stated that when RVR applied for the loan, it signed an agreement stating that the funds would be used to buy the 20 locomotives from US-based National Railway Equipment Company (NREC) in a straightforward transaction. But the bank found that by the time the loan was disbursed on July 1, 2014, the executives had created an intricate web of companies that left RVR as a mere lessee of the locomotives despite having prepaid some Sh832 million to NREC in its original status as a direct buyer. Omar, whose organization has over 226 members, told The Independent that the return of the railway line to the respective government will boost freight volumes and so is trade in the region. But some interested parties, including Moses Ogwal, the director policy advocacy at the Private Sector Foundation Uganda (PSFU) are being cautiously optimistic. Ogwal says RVR has performed below PSFU's expectations but is worried of the next entity that will handle the railway operations. "Yes, the two governments are terminating the concession but our concern is whether the new entities will perform better," Ogwal says. The departure of RVR also comes when east African countries are constructing Standard Gauge Railways. The link is planned between Mombasa, Kenya, to Kampala, Uganda, Juba, South Sudan, Addis Ababa, Ethiopia and Vurra to the Democratic Republic of Congo. So far, the construction of the 120km Nairobi-Naivasha standard gauge railway is on course following the completion of the Mombasa-Nairobi route. The Uganda government plans to start the construction of the 273 km SGR line from Malaba to Kampala route subject to the availability of funds. However, SGR is yet to be a competitor to the old railway line as construction is still far from completion. In the interview with The Independent, Kateeba, sought to reassure rail users. He said the train services are expected to improve when the two governments' take-over the operations and that freight volumes will increase. The Independent was unable to establish the latest freight volumes, but RVR carried 1.7million tons of cargo in 2013 compared with 1.6tons in the previous year. However, this is far below the freight volumes that were carried in the years prior to RVR winning the concession. A study conducted by Prof Evaristus M. Irandu from the department of Geography and Environmental Studies, University of Nairobi, themed 'Improving railway transport in Kenya: Policy options and achievements to date', shows that the Kenya-Uganda railway carried 2.5million tons of freight in 2000 but with the potential to increase to 5million tons per year. The study also noted that in 1980, a freight level of 4.3 million tons was attained, while in 1989-1990, the railway carried 3.5 million tons. Prof Irandu, who has done various studies on transport infrastructure especially in Kenya, argues that the railway transport system in the region, like the rest in the Sub-Saharan Africa, is a precarious and expensive venture mainly because of the difficult terrain, low demand, and the scarcity of human and financial resources.